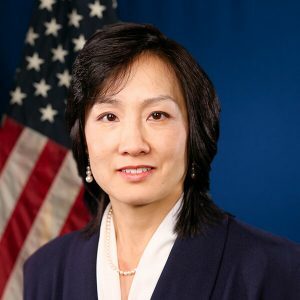 Michelle K. Lee is the former Under Secretary of Commerce for Intellectual Property and Director of the United States Patent and Trademark Office, one of the largest intellectual property offices in the world. In this position, she led a 13,000 person agency with a $3.4 billion annual budget, and was responsible for all functions of the organization and for advising the President, through the Secretary of Commerce, on domestic and international intellectual property policy matters. Ms. Lee was the first woman to be appointed to this role. She is currently the Herman Phleger Visiting Professor at Law at Stanford Law School, where she teaches a joint engineering and law course on disruptive technologies (artificial intelligence and driverless cars) and their impact on laws and regulations. She also serves on the board of Alarm.com (NASDAQ: ALRM). Ms. Lee has spent most of her professional career advising some of the country’s most innovative companies on technical, legal and business matters. She previously served as Google’s Deputy General Counsel and first Head of Patents and Patent Strategy, where she was responsible for the formulation and implementation of the company’s worldwide patent strategy. Prior to Google, Ms. Lee was a partner at the Silicon Valley law firm at Fenwick & West, where she counseled a wide range of high technology companies on intellectual property, corporate and litigation. Before Fenwick, Ms. Lee litigated patent and commercial cases at Keker & Van Nest and clerked for Judge Vaughn Walker, U.S. District Court for the Northern District of California, and Judge Paul Michel of the U.S. Court of Appeals for the Federal Circuit. Ms. Lee has been recognized by numerous organizations for her work and contributions including by Politico Magazine as one of the “Top 50 Most Influential Visionaries in American Public Policy” in 2015, by the Washingtonian Magazine as a “Tech Titan” in 2015 and by the San Francisco Business Times and San Jose Business Journal as one of the top 100 most influential women in the Silicon Valley in 2013 and the Best Bay Area IP Lawyer in 2012. Ms. Lee speaks frequently on the topics of intellectual property, innovation, public policy and inclusion as a business strategy. Ms. Lee is proud to be the 2017 ChIPs Hall of Fame recipient. She is a founding member of ChIPs and re-joined the board Jan. 1, 2018.